How did K-girl like the twin babies? Boys loved their toys yet were disappointed at the same time. So we had a long talk about that yesterday. I kept reminding them about the spirit of giving. We have to get together real soon! LOL, this is the 2nd blog I've visited that Santa has dropped off a 305 too. SWEET!!! 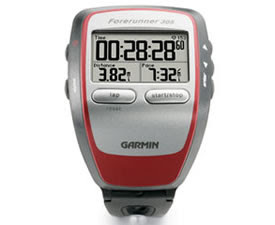 I think garmin is the official sponsor of Santa's sleigh. He must get a sweet deal on all those 305's. I changed the screen so the HR is displayed bigger and I can read the numbers easier. You can have from 1 to 4 showing. I'll keep you informed of my Grand Canyon training and if you want to join me on any of it, you are more than welcome. I invision doing camelback and some of the local mountains around here. Glad you guys had a very merry christmas. I have a 205, so I don't know much about the 305, sorry. Santa seems to have had an entire sleigh full of 305s. I've had the 305 since it came out (and the 205, and the 201, and so on and so forth). The best way to figure out all the bells and whistles is to play around with it for a while. Also make sure you install the Garmin WebUpdater software on your computer, and periodically check for updates. Every now and then there is an update that improves satellite reception. I got my 305 last February, and now I can't imagine life without it. LOL! Hope yours is treating you well! !